Notice: The order in which these log splitters are in, are based off of reviews by the people who have purchased and used them. 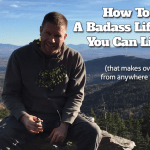 Are you using an ax to cut your wood? If so, stop! Splitting wood doesn’t have to be so hard on your body especially this day and age. Switch to an electric log splitter. It’s an essential tool for those who have wood to cut and a good investment for any homeowner. In this article, we’re going to cover everything you need to know about log splitters so you are appropriately able to pick what will work best for you and the top 10 best rated electric log splitters for sale in 2017. 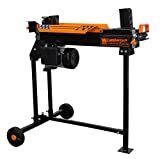 Also every log splitter mentioned is available for purchase on Amazon.com. Electric log splitters are easy to use and by just plugging it in you are ready to start. It requires very little maintenance compared to the gas log splitters which has multiple components to maintain the products lifespan. Using an electric log splitter emits no fumes and is a lot quieter than their gas rivals. The best thing about an electric log splitter is the price. It’s much more affordable for homeowners than gas log splitters. The size of the whole product is also a bonus which makes it easy to store. Even though there are so many advantages to an electric log splitter, if you are doing heavy-duty projects or large volumes of log splitting a gas log splitter might better suit your needs. There are a few different types of log splitters and picking what will work best for you is important. From deciding on the type of energy source to how big the pile of wood is that you need to cut. Different ones are better suited for different jobs. 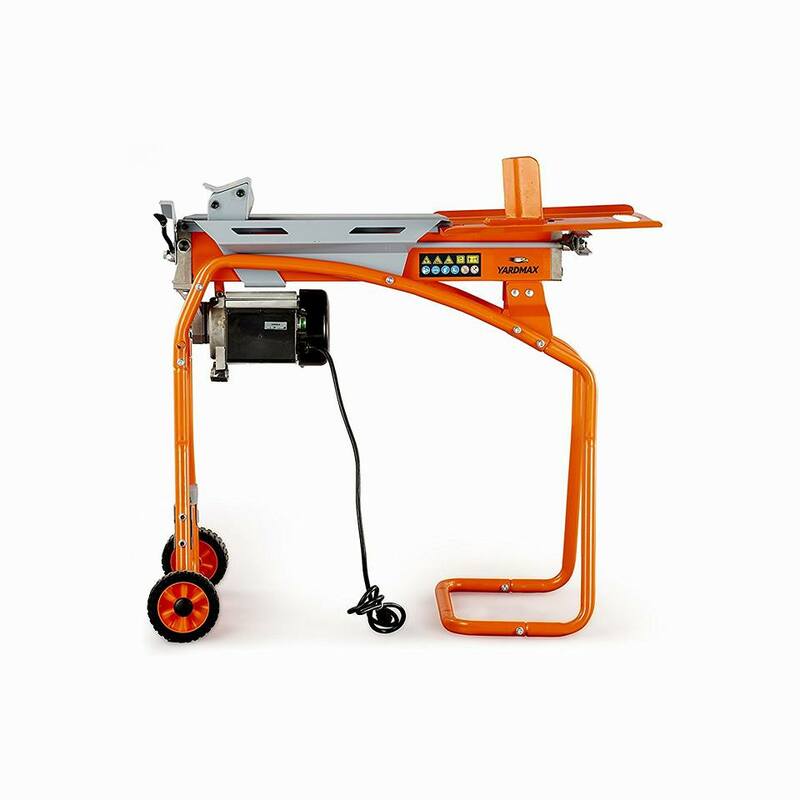 There are manual log splitters, electric log splitters and gas log splitters. 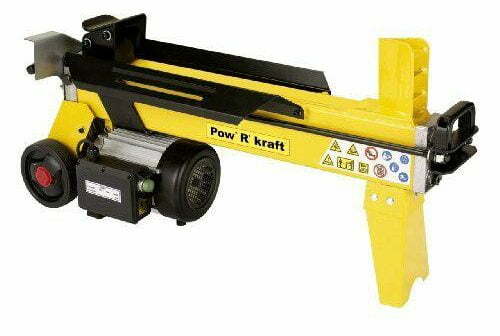 These types of log splitters are designed to do small projects and light tasks. They aren’t near as strong as a gas or electric log splitter but they will still get the job done. If you’re looking for a tool that’s going to be better than your basic ax this is a considerable option. Manual log splitters are going to be the cheapest of the bunch but keep in mind the physical requirement it will take to operate one of these. Gas powered log splitters are best if you have a large amount of wood to cut. An electric log splitter may not be up for splitting so much wood especially if its freshly cut. It requires a great deal more power to split fresh cut wood. These log splitters are big in size but road towable to make it easier to move around. Even though they may be large they are built to high standards and most of them last a very long time if maintained. Gas log splitters are faster and more powerful than electric or manual but they are also the most expensive. Because these are gas powered, they will need to have regular maintenance to stay in top working condition. Its best to check all your fluid levels often with these log splitters and to carry an extra container of fuel for large jobs. This type of log splitter runs off electricity and will need to be plugged into a power source. 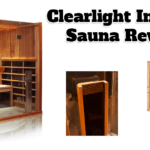 It does not put off any type of fumes and is safe for indoors such as a garage or basement. Electric powered log splitters seem to be the most popular due to the size, price of the equipment and low cost to power. They are lightweights compared to the gas log splitters and pack a decent amount of tonnage to split wood. The compact size and mobility makes storing it in your home easier. Even though electric log splitters are very easy to use and more affordable, they are not the most powerful. These are a good investment for the average person who splits wood for a fireplace or fire pit. Vertical or Horizontal Log Splitter? If your new to log splitting its best to know that there are two different positions log splitters can split wood. 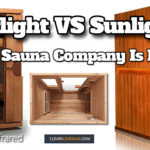 If your already familiar with this information, then you also most likely know which positon is more comfortable for you. Most splitters have the option that allows you to switch between horizontal to vertical. There is also log splitters out there that can split wood both ways, we like to call those combo splitters. Take a good look at which position is going to be comfortable for your body before you buy a product. It’s important so that you don’t hurt yourself. These are best for larger pieces of wood. This way you are able to move the wood from the ground to the splitter without having to lift it. Vertical log splitters have enough power to split most types of wood from seasoned to fresh cut. Keep in mind, lifting wood onto a horizontal log splitter is strenuous on the back if you have a lot of wood to go through but so is constantly bending over to move heavy pieces into the vertical log splitter. Horizontal log splitters are low to the ground for ease of placing the logs onto the splitter. Some come with a stand or one may be purchased so that the log splitter is at waist level. These log splitters are ideal for anyone who wants to split small logs that are light weight and can easily be lifted onto the device. There are multiple brands for log splitters, some more trusted than others. Just like with any product, some brands build more sturdy and higher quality products. While others are cheap and may not be worth investing in. Some of the well-known brands are WEN, Boss Industrial, Pow’ R’ Kraft, Grizzly and Champion Power Equipment. These brands have many years of experience building and selling electric log splitters. Cycle time is the amount of time it takes the ram to start splitting one piece of wood and then returning to its original position. This is important to know when looking to purchase any log splitter. 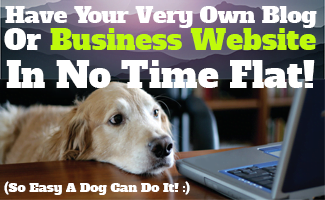 The faster it is, the more work it will get done in a short period of time. The average cycle time is 11-13 seconds. The tonnage is the amount of force a log splitter can apply to a piece of wood. The amount of tonnage you need depends on a couple of things, the size of the logs and the hardness. The more fresher and bigger the logs are the more tonnage is required to split them. The average for electric log splitters is 4-7 tons. One of the ones on our top 10 list has an 8 ton compacity though. 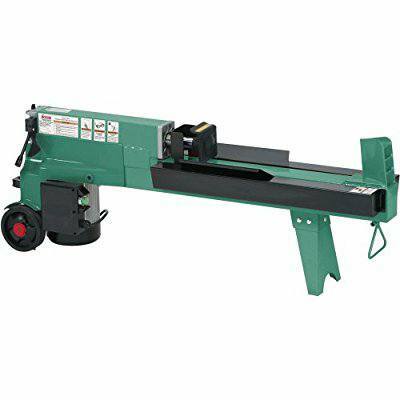 The log splitting range describes the diameter and length of a log the splitter can handle. Electric log splitters have a certain range that they can accept. This will determine the size of wood you can place on the log splitter. It is more ideal to look for a log splitter that can take larger pieces of wood. This way you can always adjust to smaller sizes if needed but you cannot adjust your log splitter to handle larger pieces that are over the range limit. When your selecting your log splitter consider the details. Find out its horsepower (HP). The bigger the motor is the more powerful the splitting force will be. Buying an electric log splitter with a powerful motor will be a great investment, especially if you’re looking for speed and reliability. For instance, an electric log splitter with 2 HP will be good for a midsize amount of wood, but if you’re looking to split an enormous amount of wood you will probably need to look for something with a 3.5 HP or higher. This may not seem important but it is. 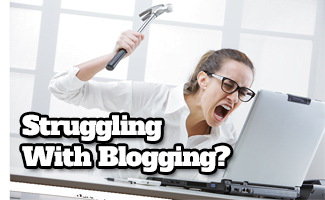 Most people will wind up using an extension cord with their electric log splitter. In this case, you need to use a 12-gauge extension cord. The extension cord gauge that you use does matter when it comes to log splitters. A lower number gauge rating has thicker internal wires where as a higher gauge rating has thinner internal wires. If you use the wrong gauge your electric log splitter won’t work at maximum power making it run hotter and affect the lifespan of your equipment. 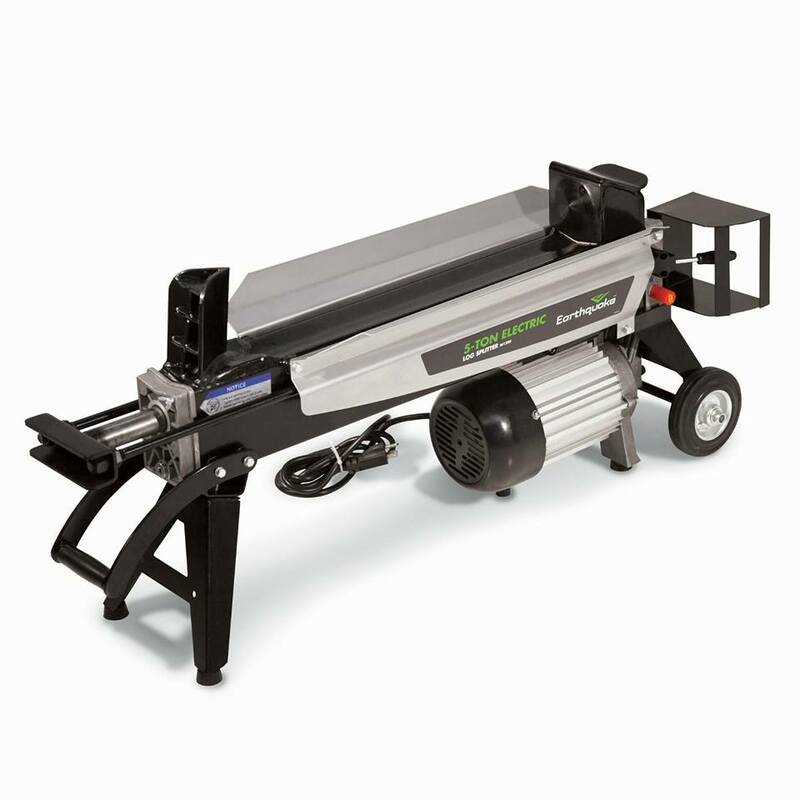 What materials are used to build a wood splitter is extremely important. 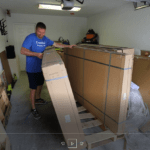 All wood splitters must be built with steel. 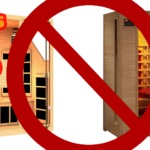 This guarantees that the product will last a long period of time if maintained. Also, reassures us it’s not going to break under the amount of pressure it is applying. How a wood splitter is built determines how dependable it will be. A solid construction of a log splitter means that it will be able to handle tough splitting jobs for many years to come. Electric wood splitters are considerably heavy unless you’re used to lifting a hundred-pound item. 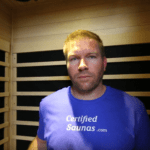 It can be strenuous on your back moving it from one area to another and can be difficult. It is ideal to have large wheels to be able to move it easier. Do consider this when transporting your wood splitter. The average weight of an electric log splitter is 110 pounds. And you should probably add around an extra 10 pounds during shipping. An electric log splitter is perfect for many people. Weather the reason is to heat their home or to throw a few logs out back in the fire pit, there are really quite a few reasons. There are also many advantages to having an electric log splitter over a gas log splitter. The maintenance is a perfect example. Gas log splitters have so many things that need to be kept up in order to maintain the longevity of the equipment. 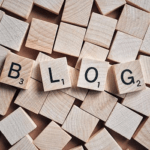 Most individuals don’t do the maintenance properly or don’t want to do it at all and this is where an electric log splitter comes in with all its benefits. You won’t have to worry about fumes, filters, filing it up with gasoline constantly and replacing parts that wear easily due to more components. Buying an electric log splitter saves you more money in the long run too. 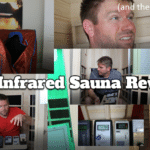 You can feel more comfortable about using it because it emits no fumes and is better for the environment. But, depending on how much log splitting you’re actually doing you may need to get a gas log splitter. Electric log splitters are nice but they do have limits to the sizes you can place in them to split. Every electric log splitter has safety measures in place. These are to prevent accidents if anything should happen. Most electric log splitters require two hands to operate while it is actively splitting the logs preventing your hands from getting in the way. There are some log splitters out there that have a single hand operation though. Other features may be included such as an overload circuit reset button. Which may prevent damage to the circuit your log splitter is connected to as well as the log splitter itself. There is always a way to prevent accidents. Don’t take short cuts and stick to the safety guidelines for your electric log splitter. When you are about to buy an electric log splitter make sure it comes with a warranty. Most importantly though, make sure the warranty is more than one year. This is crucial. A long warranty will signify that the manufacturers are standing by the performance, structure, and quality of their product. If you want to look further into the background of the product check out the manufacturer. Some of the most popular ones are listed above. The companies that have lots of positive customer reviews are going to have more reliable high quality products which means a great investment for you when you buy an electric log splitter. This electric log splitter is one of the most powerful in its class and is able to split logs up to 10 inches in diameter and 20 ½ inches in length. It features a 2-horsepower electric motor and automatic ram return that cuts job time down by half. This particular electric log splitter is a single hand operation, making it easier on the user. When grasping the single handle and then releasing, the ram instantly reverses making it very safe to use. It also has a push button to start. This electric log splitter comes fully assembled making it usable right out of the box. It was built with steel and sturdy materials. The paint is of high quality to withstand elements and constant usage. The rubber wheels are made of high density rubber for easy transportation around the homeowner’s property. 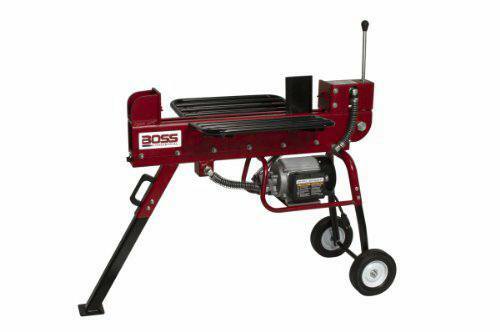 The Boss Industrial 7 ton uses a standard 15 amps so your able to plug it in virtually anywhere and start splitting logs. This product is also low on noise due to the electric motor. This model has a safety feature to prevent the motor from burning up while using it to split large amounts. 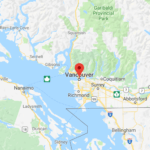 In addition, the professional grade hydraulic system is a positive feature that will have you splitting many different kinds of wood like butter. Has safety feature to prevent motor from burning up. Ships with small amount of hydraulic fluid. Advising to purchase extra hydraulic fluid which averages out between $15- $30. 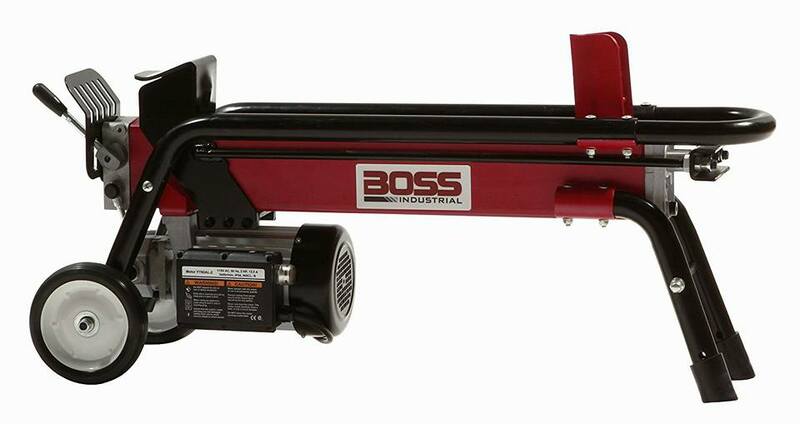 The Boss Industrial 7 ton ranked number 1 on our list due to the overwhelming amount of positive reviews. With the one hand operation and so many key features this electric log splitter it a significant asset for any homeowner. The Grizzly H8171 comes from a reliable background and it’s no wonder it performs so well. This electric log splitter can handle a wide range of tough jobs. With a max compacity for logs up to 10 inches in diameter and 20 inches in length, it can split through dense trees and numerous cross grains. Outshining its electric log splitting rivals this machine can withstand many of the same jobs as a gas splitter. This log splitter is also dual-hand operated for your safety. Weighing 110 pounds this electric log splitter is an excellent choice for homeowners to invest in. With a 5-ton splitting force this log splitter moves through wood without difficulty. This log splitter also has durable sturdy wheels for mobility. Keep in mind it still needs to be plugged in, but using the standard 15-amp circuit you’re able to plug it in almost anywhere. Built with high quality steel and structurally sturdy the Grizzly placed second in our top 10. If you’re looking for a log splitter that can handle tough jobs without bumping it up to a gas log splitter, this is the electric log splitter for you. 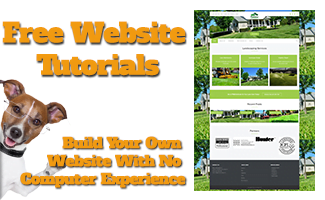 With lots of key features and many positive reviews this is a great tool to have. The most appealing feature about this electric log splitter is that it is a combo cutter, it can split logs horizontal or vertical. This log splitter is operated with two hands putting operator safety first. When one hand lets go, the ram immediately reverses. The electric motor is an in-house design as well as manufactured in-house too. Making this a reliable product knowing YardMax is so confident in their own company to provide what we need as far as a log splitter goes. As with many electric log splitters this runs off the standard 15 amps and has a splitting force of 5 tons to get the job done. This electric log splitter is suitable for logs up to 20 ½ inches in length and 10 inches in diameter. Lightweight 6 inch wheels are the only things you have to attach otherwise this product is fully assembled. 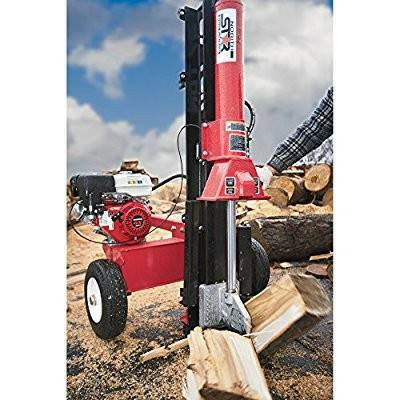 The YardMax 5-ton electric log splitter is one of a kind on this list due to the stand, log tray, and stroke limiter that is included with the purchase of this product. The stand creates a stable work surface and also allows the operator to not have to bend over or squat. A stroke limiter cuts down the time it takes to split shorter logs. With so many positive features from this electric log splitter it’s no wonder why it placed 3ed in our top 10. This electric log splitter is ideal for someone that likes to change it up from cutting horizontal to vertical, or maybe is unsure of what position is most comfortable. It’s on the lightweight side and has additional items making it more desirable than the other electric log splitters. Splits wood without any difficulty. This electric log splitter provides 8 tons of dual action power. Making it a big contender as well. The two way splitting cuts down on time and is more efficient. It can split logs up to 20 ½ inches in length and up to 12 inches in diameter with little effort. For easy operation, one handle controls this electric log splitter. Which is a favorable feature among many people. Operating with 3,400 psi of splitting force should do the job no problem for anyone using this product. It runs on a 2-horsepower motor and easily starts at the push of a button. This electric log splitter uses the standard 15-amp circuit so you can plug it in anywhere and get started. High quality steel and paint was used in the making of this electric log splitter to give the operator many years out of this product. Because of the electric motor this log splitter makes very little sound while splitting the wood with ease. Also has very sturdy wheels to move the machine from one area to another. This is a pretty decent sized log splitter with a splitting force of 8 tons which is above average for an electric log splitter. The single hand operation makes it easy and the dual splitting action makes it very appealing. The weight of the log splitter isn’t ideal but it will get the job done in a timely fashion. This light weight log splitter, compared to the other electric log splitters on our list, brings a driving force of 5 tons. It has the average 2-horsepower motor for a driving force and uses the standard 15-amp circuit making it easy to plug in and go. Homeowners will be able to easily move this log splitter around with rear plastic wheels. This electric log splitter uses a dual handed safety switch system with comfortable grip handles. Investing in a high-quality product, such as this one, means it’s made of steel and promotes a long-lasting wear year after year. The compact size makes this log splitter easy to store when not in use. This electric log splitter makes less noise than the smallest gas log splitter. As with any electric log splitter after so many hours of use, changing hydraulic fluid is essential to keeping your product maintained. Hydraulic fluid may leak. Advise to buy more hydraulic fluid. This compact electric log splitter may only have 5 tons of pressure but it weighs less compared to other electric log splitters and can cut through wood smoothly. Many good reviews about this log splitter. Highly recommended for people that want an electric log splitter and don’t want something so heavy. The WEN 56206 is a tough electric log splitter many compete with. With 6-tons backing this product and a welded steel construction, this log splitter will take care of all your log splitting needs. It has a maximum of 10 inches in diameter and 20 ½ inches in length for logs that it can handle. Plugging it in will be no problem because it goes right into a 3-prong outlet which conveniently is common in every home. An extra feature that is nice is that this electric log splitter can operate under 40 degrees Fahrenheit but don’t forget to add the correct hydraulic fluid for this to be possible. The WEN is a two-hand operation making this log splitter safer to use, it also has strategically placed handles. With a safety feature like this, once you let go of a handle the ram instantly retracts back to its original state. There is no assembly required. It comes ready to pull out of the box and start using. This electric log splitter is only 100 pounds and moves with ease due to the large six inch never flat tires. User manual not user friendly. Must pay Very close attention to every detail. 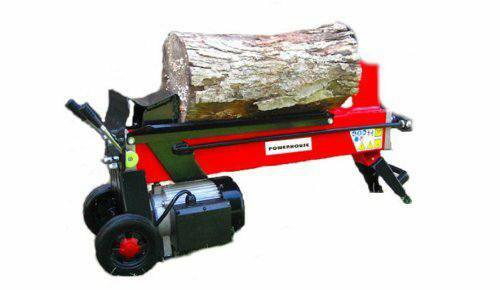 This is a high quality electric log splitter and would be a great asset, if you read the user manual thoroughly. Lots of reviews warn about it. Otherwise it is an excellent product that will last you a very long time and make splitting wood very convenient. 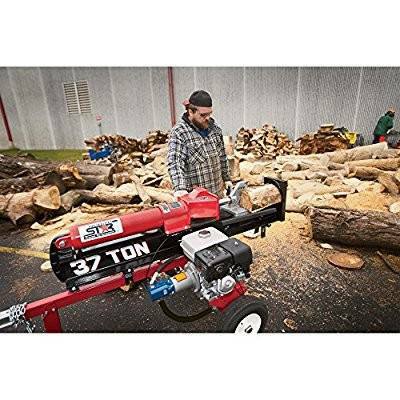 Operating with 4-tons, this horizontal electric log splitter can easily whip through a cord of wood. It can split logs up to 12 inches in diameter and 20 inches in length with very little effort. This log splitter has a 2-horsepowered motor and runs off of a 15-amp circuit making it simple to plug in and start splitting wood. An interesting feature it has is built-in ground fault interrupt protection with a reset switch. This electric log splitter is operated with both hands making sure your hands are out of the danger zone. It was constructed with heavy duty steel and hydraulic components for increased durability. Arrives fully assembled and ready to use this powerful electric log splitter is ideal for the average homeowner. Temperature for best working in is 40 degrees to 104 degrees Fahrenheit. An excellent electric log splitter and very sturdy. Small light weight and easy to store. A good investment for anyone looking to split an average amount of wood. Lots of positive reviews. This workhorse of a log splitter is considered the most powerful horizontal electric log splitter, period. With the desirable one hand operation and the instant retractable ram it splits wood like a hot knife on butter. Most highly sought after electric log splitter. One of the added features it has is a side mounting rack so logs can easily be cleared for the next split. Another feature is that this electric log splitter has a built-in stand. No hunching over to work this log splitter. 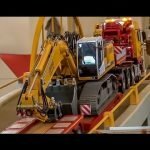 As if having 10 tons of pressure wasn’t enough this also features professional grade hydraulics making everything operate smoother. It does require a 20-amp circuit. All sounds too good to be true, right? Well, it is just a little bit. The Boss Industrial ED10T20 is currently priced out a little over 1,000 dollars. Which makes it the most expensive one on this list. Also, this amazing electric log splitter weighs in at 214 pounds making it the heaviest on this list as well. 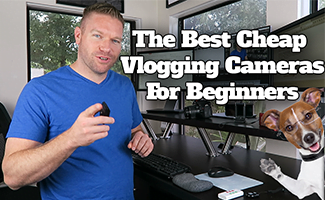 If you don’t mind those two factors and are looking to invest in a very decent product, this one would be perfect for you. Reviews state you need to buy the hydraulic oil and the manufacturer does not list the compacity to which this log splitter holds. Get a gallon though. The dual splitting action and the amount of force this 10-ton has is very impressive. Lots of positive reviews. Multiple people came back and updated their reviews over a year or two and say this electric log splitter works amazing. The only reason it makes number 8 on our list is due to the price and weight. 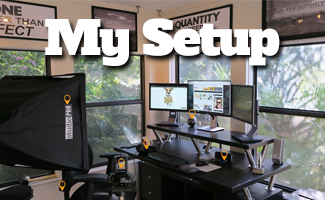 Otherwise best investment option. Earthquake W1200 has a splitting force of 5-tons and runs off a standard 15-amp circuit. 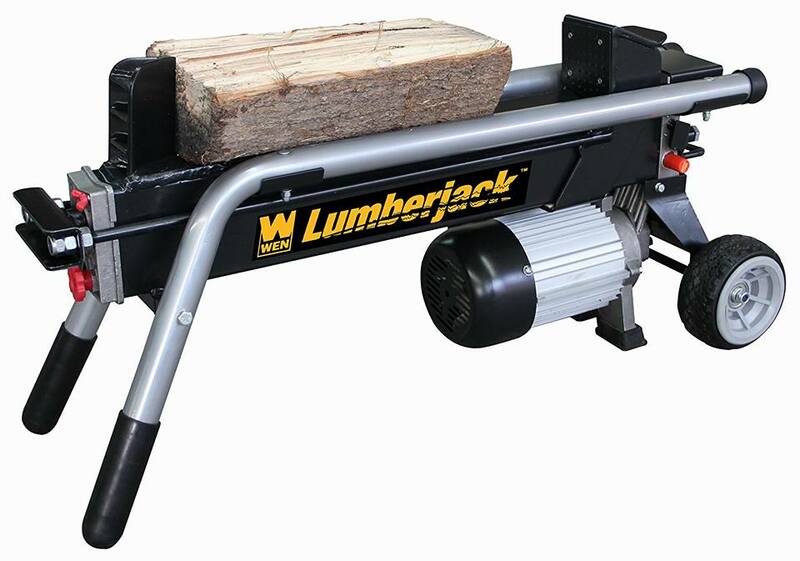 This horizontal log splitter is very light weight compared to many others with only weighing 99 pounds. The maximum length of a log to which it can accept is 20 inches in length and 10 inches in diameter. With tough steel construction and long-lasting steel wheels that are made to withstand any terrain this electric log splitter is perfect for the average homeowner who is looking to split a normal amount of wood to heat a home. Cannot be used above 3,250 ft.
A tad slower cycle time compared to other electric log splitter. 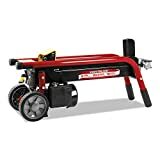 With this product weighing under 100 pounds this is ideal for anyone looking for a log splitter on the lighter side and still capable of doing a good job. 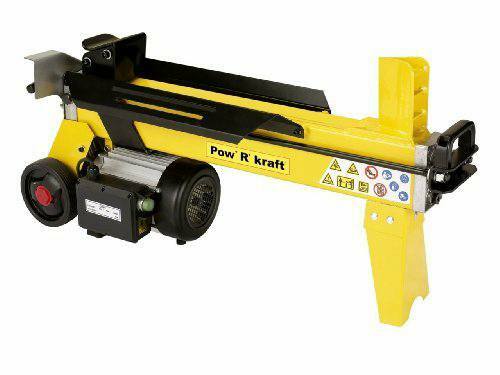 Having a 3-horsepowered motor makes splitting logs easy for this product. It also runs off of 20 amps. 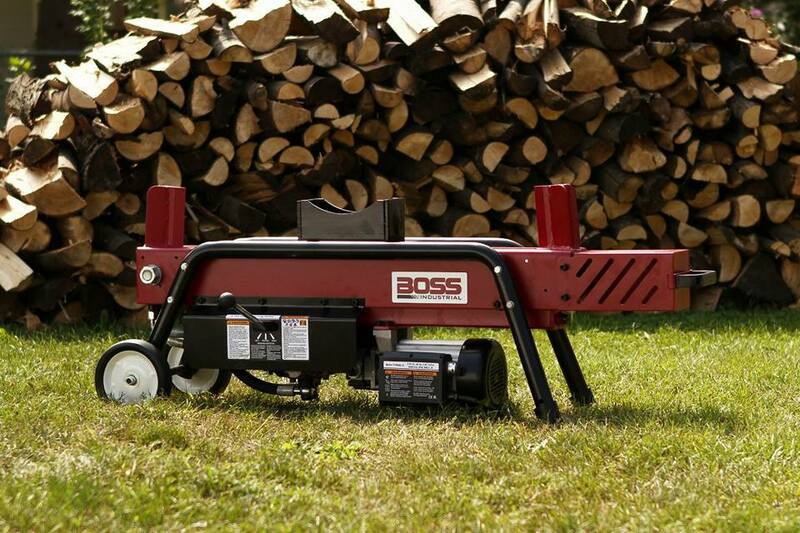 This horizontal electric log splitter can handle a log up to 12 inches in diameter and 20 inches long. Nice thing about this log splitter is that it’s 104 pounds, one of the lightweights compared to other log splitters. The Powerhouse XM-380 is operated with two hands keeping safety in mind. Once you remove your hand from the lever, the ram automatically retracts so you can load up the next log as soon as possible. This log splitter has the ability to split more than one hundred logs within an hour. With compact wide wheels, it is very easy to move around. A nice feature it has is that if you overload the log splitter it simply needs to be power cycled to return to normal operation. Good quality electric log splitter and the fact that is has a 3-horsepowered motor makes it more attractive to purchase. Cuts wood smoothly. If you’re looking to split wood that is seasoned, any of these electric log splitters will do. If the wood your trying to split is a little fresher, you might need a 6-ton or higher. There have been a few 5-tons that do the job perfectly. 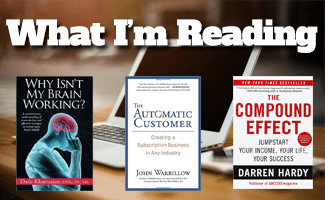 Reading the reviews of what others have experienced will help. How often do I service my electric log splitter? Servicing your log splitter depends on a couple of factors like how often you use it and if it requires hydraulic fluid. Electric log splitters can go for a long time without being serviced. If yours has hydraulic fluid be sure to check the fluid level after each use. If you have any questions about servicing your log splitter check with your brand’s service center. I hope after going over all this information something somewhere along the way has helped you. 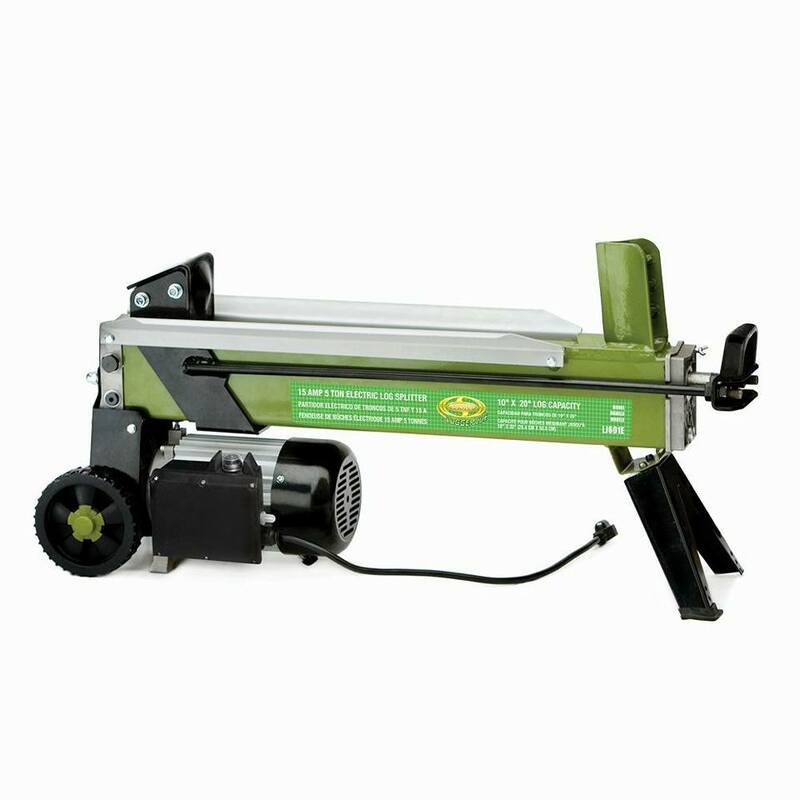 It is absolutely essential for very homeowner or anyone in general that splits wood to buy an electric wood splitter. These devices not only save time but save the environment from toxic fumes produced by the gas log splitters. Electric log splitters are an asset and over time will prove their worth, saving you from any painful injuries you may sustain while using an ax or devoting yourself to long hours of splitting. These log splitters make everything easier for you. I hope your now able to pick an electric log splitter according to your needs.